Firstly congratulations on your GD spot how wonderful. Your card is simply adorable, I love the fact that Julee has come up with a cloud die at last too. Very pretty and that is such a cute bunny! I understand your excitement…I think I would have screamed in sheer delight! Congrats and your card is wonderful! Love that floral frame and sweet bunny! So cute. Love the cute bunny. Wow, I would be excited too. Congrats on being a guest designer. Oh, I just LOVE your card, it's really cute. Those new sets are fabulous, thanks for the inspiration!! And congrats on your guest designer gig!! Great idea for a baby card. I love it! Wow, what a sweet baby card. Yes I do love that sweet polka dot bunny. Your cloudy background is beautiful. Congrats on being a guest designer. SSSSOOOOOOO cute! I'll be looking to buy this ss and die! Love it, love it, love it! The bunny is perfect! I need more bunnies anyway for my granddaughters cards and pages! Aren't you clever to cut your own cloud stencil! I love this sweet baby card! Such a cute baby card! Big congrats on you GDT stint! OMGosh what an honor. Congrats on your CDT spot. Thanks for sharing your adorable card. Such a sweet baby card! Im excited about all these great new releases! Very sweet card and cute bunny. I like how you added gesso to the designer paper, it's lovely! I just want to hug that bunny. Love that big sentiment and the way you have used it. Adorable! Love all the perfect elements you put together. Love this stamp set as I await my newest grandbaby. So sweet! Love that polka dot bunny and perfect sentiment for a onesie! Love your darling card and this new release!!! Precious baby card. So very adorable. your card looks super sweet and pretty! Oh I just love this! The polka dot bunny is the cutest! Darling bunny! Love your sweet card! Sweet card. Congrats on being a guest diva. What a sweet card. I love the clouds and the pastel bunny. Nicely done! So sweet–love the clouds and your choice of papers. How adorable!! That little polka dotted bunny is super cute! Such an adorable baby card! Great color choice, those are the new Pantene colors! This is such a delightful card! Love those sweet little gesso clouds in the background and the soft beautiful papers you chose. So glad to have you guesting with us this release! Too cute! 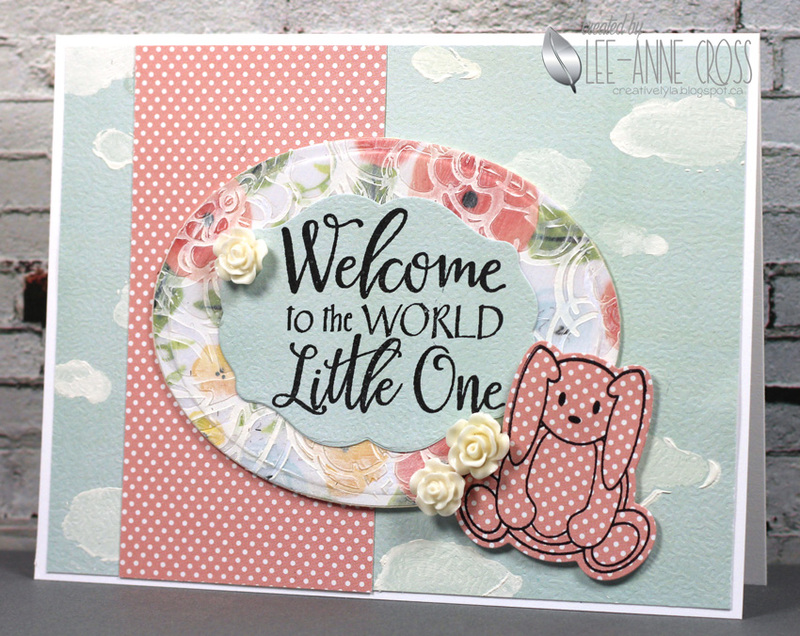 The little bunny is so sweet and I really love that you chose polka dot paper for it. This release is awesome! Such a lovely card – and a great release! Julee's handwritten font is my favorite! Love this darling and always needed sentiment! Love the unit. So cute. This is so cute. I like the dotted bunny. Previous Previous post: Margarita Cupcake Anyone?